A standard reference for decades, this new edition of Pipe Welding Procedures continues to reinforce the welder's understanding of procedures. 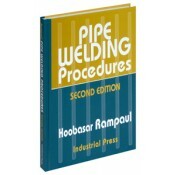 Drawing on his extensive practical and teaching experience in the field, the author describes in detail the manipulating procedures used to weld pipe joints. You will find useful information on heat input and distribution, essentials of shielded metal-arc technology, distortion, pipe welding defects, welding safety, essentials of welding metallurgy, and qualification of the welding procedure and the welder.